Why are you reporting this picture? 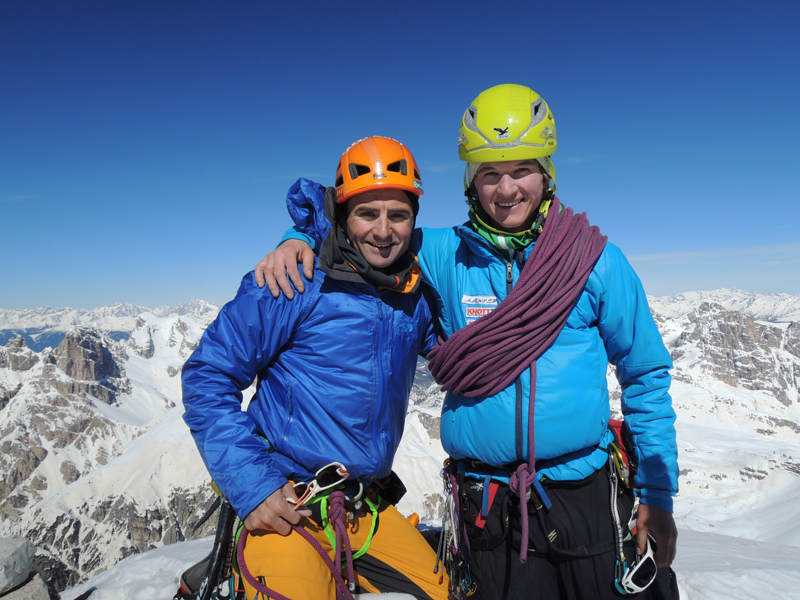 On Monday 17 March Ueli Steck and I carried out the first winter Trilogy up the three North Faces by climbing the "Cassin" route up Cima Ovest, via Comici up Cima Grande and the Innerkofler route with a north face start up Cima Piccola. 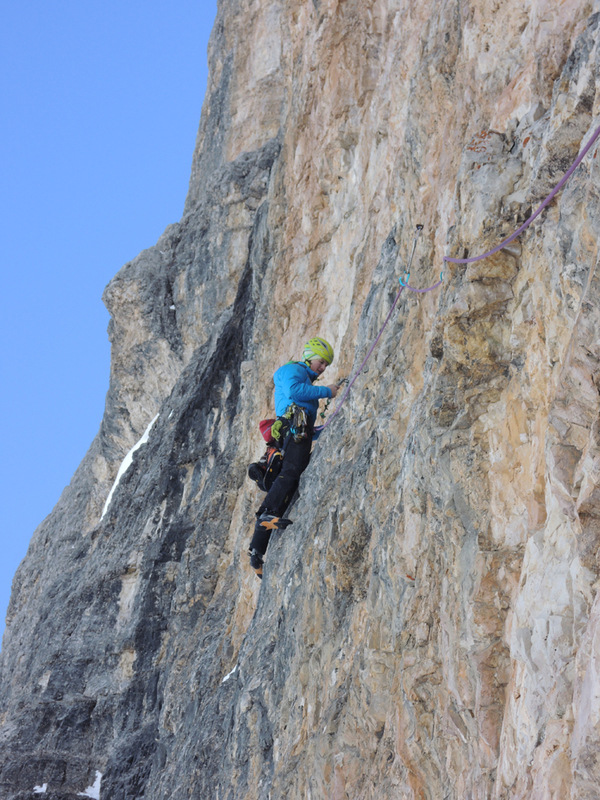 The three classic North Face routes. we were both pretty surprised. 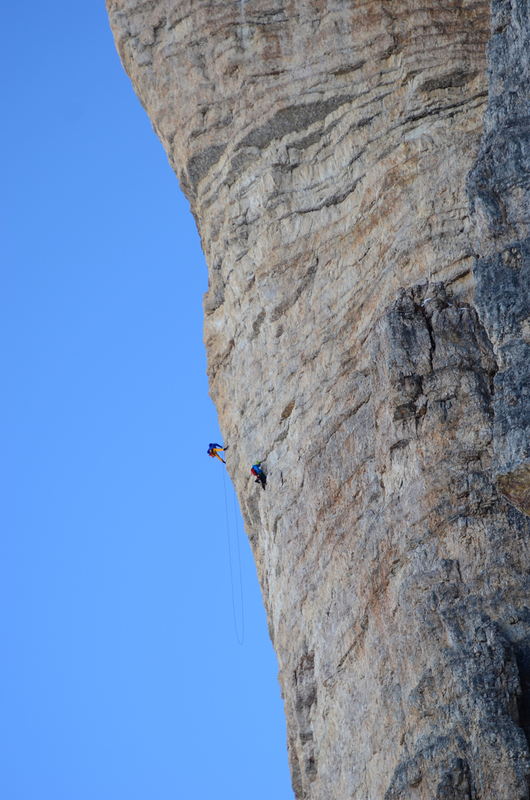 By simul-climbing and making running belays we saved a lot of time and made fast progress. We needed an hour for the descent. 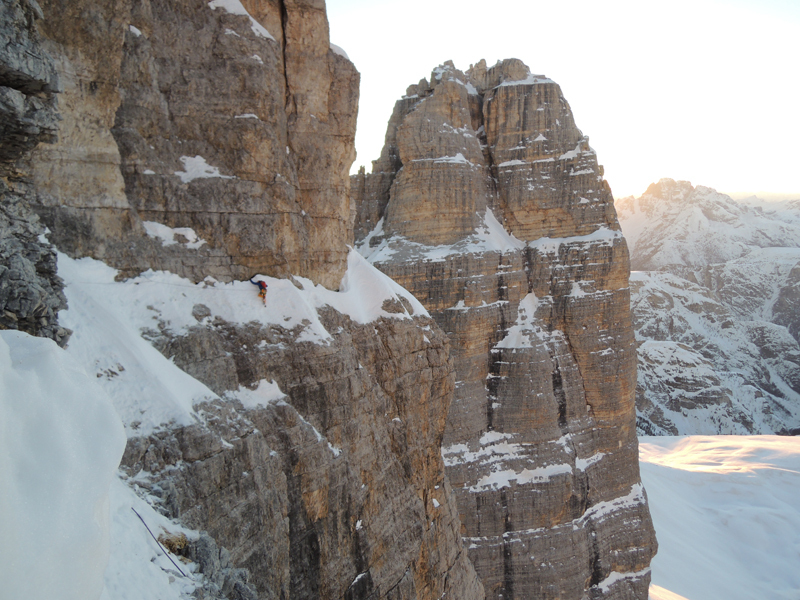 Our friend Lukas Binder was at the col between Cima Ovest and he'd melted some water for us. We had a short rest, ate and drank and then descended to the start of the Comici route. We soloed up the pedestal and the first pitch and then things got going again. We climbed simultaneously and also made extremely long pitches and were really quick up to the ledge, while this slowed us down a bit due to the vast amount of snow as we traversed across it. This was followed by the descent, not particularly easy in the dark, but we reached the start of Innerkofler at about 21:00 by descending to the col between Cima Grande and Cima Piccola. Florian Rex welcomed us with warm tea and coke. 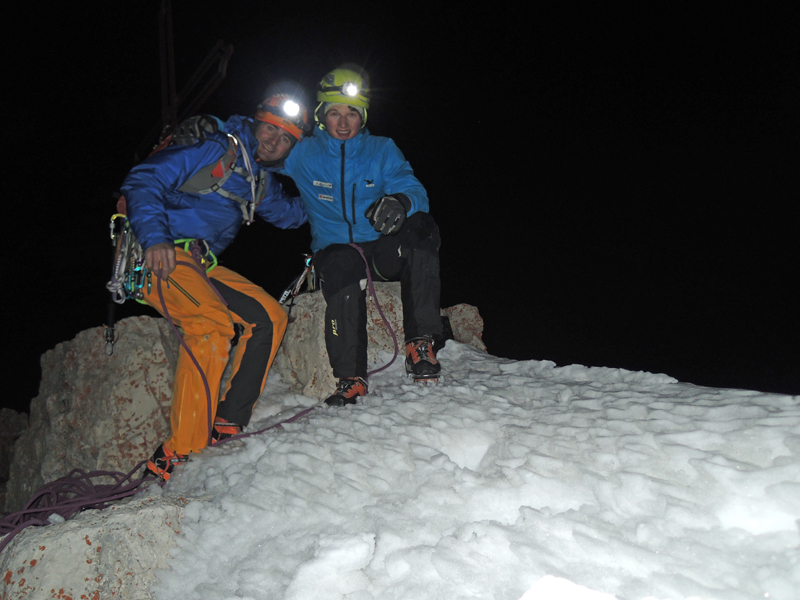 We dressed up warmly and set off at about 21:30 up the North Face of Cima Piccola. I don't know the name of the line we followed up the the north col, but this offered classic alpine mixed terrain, with a small technical section to breach a large cornice. 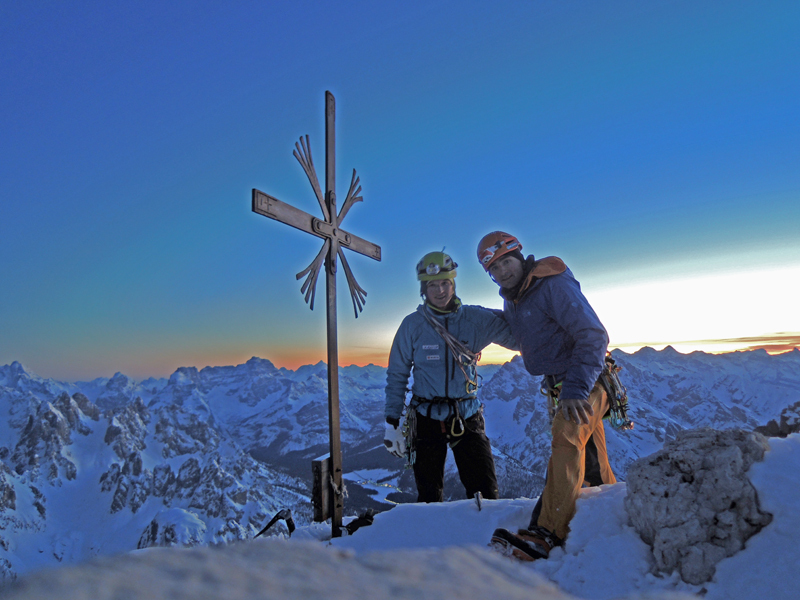 We followed the Innerkofler route from the col to the summit and reached this at 0:20, admittedly pretty exhausted. We shook hands and were both pretty happy. We'd actually reckoned with a total time somewhere in the region of 30 hours, perhaps even more, but in the end we needed circa 16 hours (15 hours 42 minutes)... we were fairly surprised... but sometimes there are simply perfect days when everything slips into place - conditions were good, the team was good, we were strong mentally. We stumbled in to the Auronzo hut at 2:00am, woke up Florian and opened a bottle of superb wine dating back to 2006 and listened to "Days like this" from the Toten Hosen on Ueli's iPhone.